Kenneth is a very loving and affectionate child who enjoys being playful. On weekends, he enjoys going to the movies, skating, bike riding and swimming. Kenneth loves to play with his siblings. 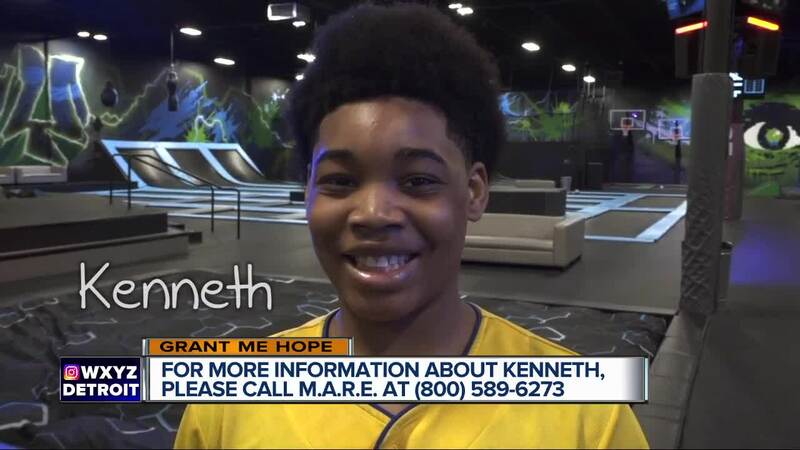 DETROIT (WXYZ) — From sports to movies to video games, Kenneth has a lot of interests. And the 13-year-old who is in foster care is hoping to share those interests – and more -- with new adoptive parents one day. “I want a family that will take me to the movies and go to football games,” he said when asked what he’d like in a forever family. When it comes to school, Kenneth loves math. He aims to go to college one day. “I’d like to go to the University of Michigan,” said Kenneth. Travel is also on his wish-list. “If I could go anywhere in the world, I’d want to go to Hawaii. I’ve never been there before,” he said. “He’s an active young boy. He’s quiet when you first get to know him. But once he becomes comfortable, he’ll goof around,” said his worker. “He is inquisitive about the things around him. He loves to know about cars,” she added. “He really takes to people who take the time to get to know him,” his worker explained. He has a special bond with his older brother and his older sister. The Michigan Adoption Resource Exchange says it’s important that he is able to maintain contact with his siblings. Also, he’s grown up in the Detroit area his whole life, so the city is where he would like to be. If you’d like to learn more about Kenneth, click here. If you’d like to talk with an Adoption Navigator at the Michigan Adoption Resource Exchange , call (800)589-6273. If you’re not able to adopt, please consider helping out by sharing Kenneth’s story on social media. Thank you!